Transylvania World is a unique brand in the making and a Romanian mark, a country-sized project, created and administrated by the not-for-profit association of the same name, Transylvania World Association. Overall „brand” means an honored promise, made up by a series of components which generate loyalty, and awareness, materialized through sales. In other words the „brand” does not exist in marketing terms until the moment when the awareness and the defined product/services sales reach significant levels. Until we reach the above-mentioned levels, we can talk about a brand in the making and about its elements and potential. We can also discuss about officially registered commercial marks for the brand in the making, about the brand manager, products, services, activities and the related projects. The situation for our brand project is distinct as a series of its components already exist and their awareness levels are high, while generating significant global sales even though there is no global manager for these components. It is highly important that the person reading these materials, especially if not familiar with marketing, makes the distinction between the "brand”, "mark” and product notions. For its inhabitants, for Romania, Transylvania means a territory, a geographical area. However, for most foreigners, "Transylvania” means a product. More precisely, Transylvania means a cinema related product and more recently a touristic product. Transylvania as a cinema or literature related product represents the mystical world, the medieval-gothic fairy-tale setting associated with literary works such as "The Castle from the Carpathians” written by Jules Verne and „Dracula” written by Bram Stoker. At the same time, Transylvania is associated with some famous Hollywood movies, such as "Dracula”, "Harry Potter” or animations such as "Hotel Transylvania”. The term "Transylvania” appears in 116 movie titles on IMBD.com, the most popular source of information for world-wide cinema, whilst the term "Disney”, a 40 billion dollar brand, appears in 437 titles. For the movie industry, such as "Hotel Transylvania” for example, the term "Transylvania” represents (besides a commercial reason based on its awareness) a term which is part of the movie trademark. In other words, no entity can produce a movie whose title contains the associated terms "Hotel" and "Transylvania”. An important aspect for the brand we are developing, blocking the usage of „Hotel Transylvania” does not mean that other cinematographic works with "Transylvania” in their title cannot be released. The same goes for other movies or literary works with the term "Dracula” in the title, without needing the license from Universal Studios (who subsequently owns the "Dracula” brand) for the screening of Bram Stoker’s novel. Transylvania as a touristic product represents an incursion in the medieval-gothic scenery illustrated by the well-conserved ramparts and fortified churches found within this territory, in the heart of the wild Carpathian Mountains, in the scenery and unique atmosphere generated by the abbeys from Bucovina, in the atmosphere and the general image of the village and the traditional Romanian household, in the mystery generated by the Cucuteni Civilization and the ancient Dacians, and alongside the touristic objectives associated with the legends surrounding the vampire count Dracula. The touristic product is being profoundly promoted by the cinematographic product. Without the global promotion (by film and literature) in nowadays’ setting, we could not even talk about an international touristic product. An important contribution for the worldwide touristic promotion of Transylvania goes to the guild of Romanian photographers, who, by using social media and help from diaspora, managed to virally spread out Transylvania’s image, without any investment in publicity. This is the main reason why Transylvania World association will develop, among other project promotion brands, a portal dedicated for international touristic photos, for elite foreign photographers. Transylvania as a symbol for Romanian natural and hand-made products does not yet represent an international product. This aspect is taken into account and constitutes a main focus for Transylvania World Association. If Transylvania represents the mystic world, the fairy-like medieval-gothic setting,"Dracula” represents the main character of the story, akin to how Mickey Mouse is the main character for the magical Disney world. Dracula is a literary and cinematographic product, who managed to resurrect the ancient vampire concept and, in parallel, the werewolf concept as well. These two concepts, the products, are the basis for a billion dollar cinematographic industry and indirectly the basis for a global market for diversified products, whose value are gigantic but cannot be estimated precisely. The impossibility of predicting the exact value is due to the fact that "Dracula” is not an administrated brand owned by a global brand manager. Thousands of products and services throughout the world have "Dracula” in their name. Dracula is not a global touristic product, but as a cinematographic product, related to Transylvania World, he is a key element which contributes directly and indirectly to Romania’s touristic promotion. Unfortunately, the wrong interpretations for this term due to not knowing the historical truth and the Dacian mythology, because of the false association of the fantastic character with real historical figure of Vlad the Impaler, lead to image prejudices for Transylvania and Romania as well. By initiating the global brand, Transylvania World association is trying to change this fact, but the awareness of the Dracula brand is a key element for any Transylvanian brand strategy. Transylvania World starts its journey for developing a global brand for Transylvania, with a brand capital already taken care of and using the awareness generated by the terms "Transylvania” and "Dracula”, trying to offer Romania all the advantages ensued by this initiative and which Transylvania fully deserves. 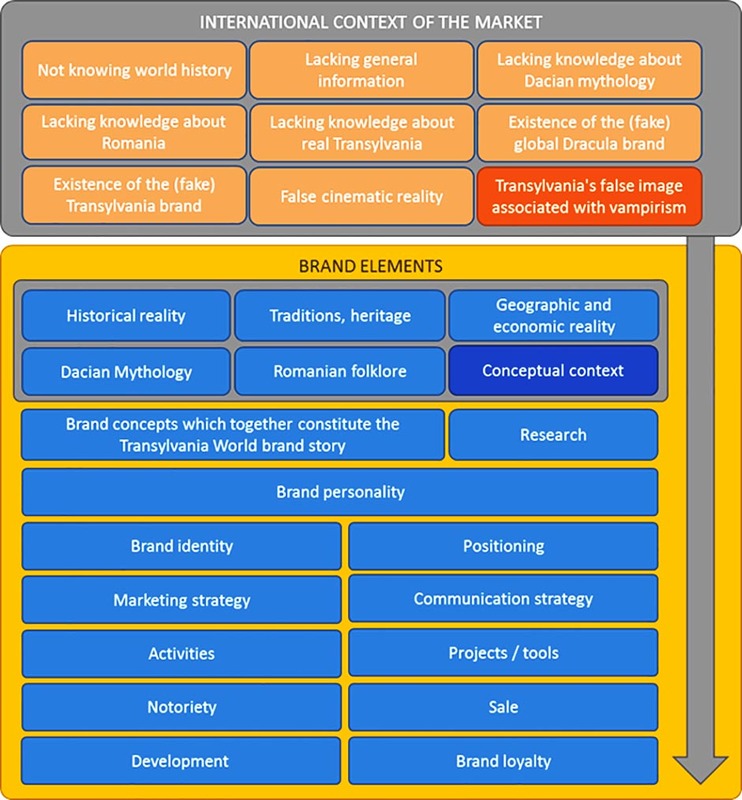 The situation for Transylvania World brand is distinct because, unlike other global brands which develop their own products in the long term alongside developing the brand per-se, in our instance we have two products that are already brands in their own, well-known and generating profit, but brands that are not holders which we partially take over as public space capital. This situation reflects in the work conduct and upon all the brand elements: research, identity, concept, positioning, personality, brand awareness, brand loyalty and diverse strategies including the activities and the projects identified and developed by the association.